La Jolla is known as “the jewel of San Diego” because of its beautiful beaches, world-renowned institutions, fine art and restaurants. La Jolla is also home to one of the world’s top golf courses and San Diego’s premier luxury resort, The Lodge at Torrey Pines. 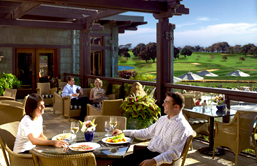 The Lodge at Torrey Pines has been awarded the prestigious AAA Five Diamond rating for 12 consecutive years. It’s located on the 18th hole of the legendary Torrey Pines Golf Course, which is home to the annual Farmers Insurance Open. Getting a tee time can be tough, especially for out-of-towners. Fortunately, The Lodge offers golf packages for guests who are looking to hit the links. 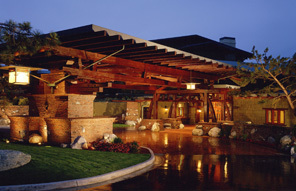 The hotel also features a complimentary Audi service, spa, fitness center, heated saline pool and croquet lawn. May 29th-31st, The Lodge will host the James Beard Foundation’s Celebrity Chef Tour, a 3-day culinary extravaganza. Executive Chef Jeff Jackson, along with Food Network star Beau MacMillan and James Beard Foundation Award winner Carrie Nahabedian, will be cooking up some amazing meals, featuring farm-fresh ingredients and fine California wines. For reservations and package information for the Celebrity Chef Tour, click here or call 858-453-4420. And to see much more of what The Lodge at Torrey Pines has to offer, be sure to watch our story below!